Our walk with Kannika and Madee, Phuket Elephant Sanctuary. Thailand’s Asian elephant suffer immensely despite our good intentions. While our infatuation for these gentle giants should stop at admiring them from afar, we instead voraciously pursue an intimate elephant encounter. We’re not happy until we post that baby elephant selfie, watch them prance on stage, have them paint us a picture or climb on their backs for a ride. 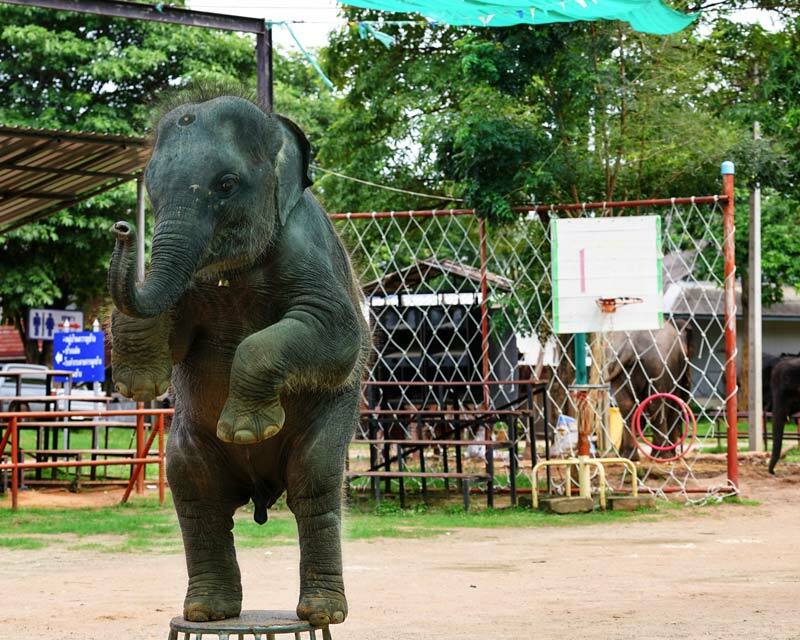 Such forced and unnatural forms of ‘entertainment’ are the results of breaking an elephant’s spirit in the most wicked of ways, instilling fear and dominating the most revered animal of the Thai Kingdom. We’re slowly learning to place the wellbeing of the Thai elephants before profit and pleasure, supported by a growing international movement for ethical elephant tourism. 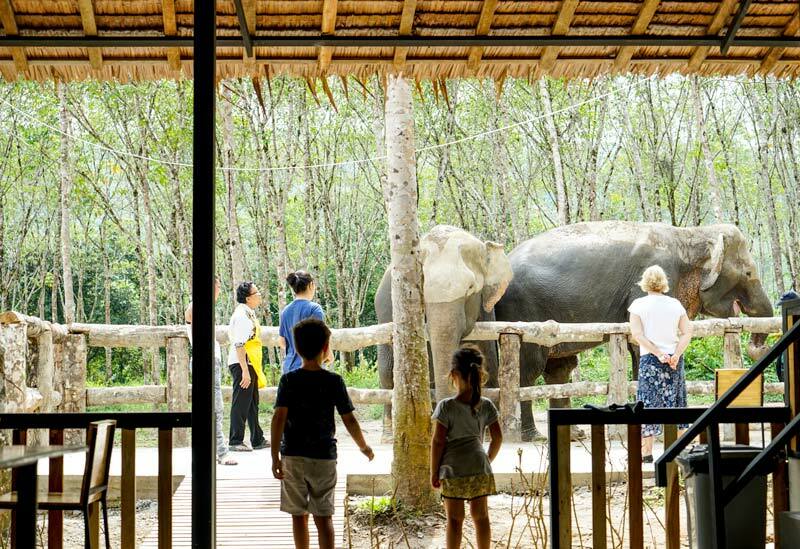 The recently opened Phuket Elephant Sanctuary is the first of it’s kind in the tourist mecca, pioneering a new way where Mahouts (keeper), elephants and visitors can respectfully coexist, without exploiting elephants and robbing the livelihoods of their caretakers. 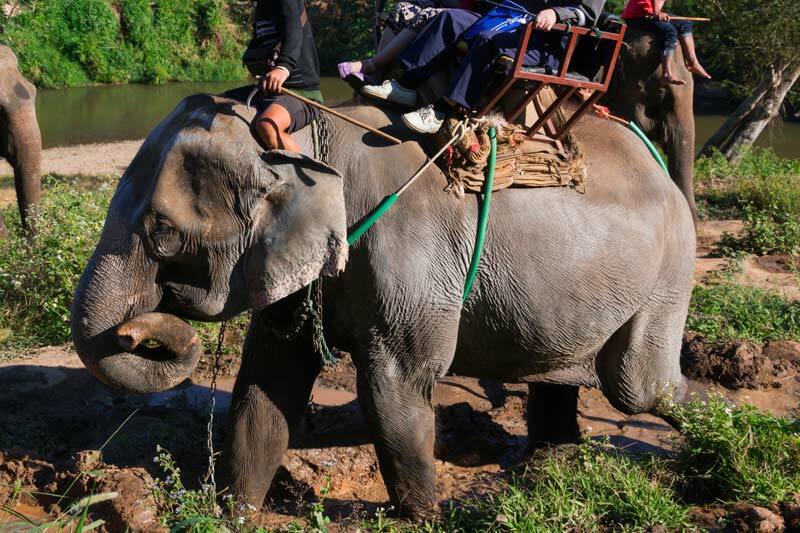 Touted as an exhilarating bucket list experience, we assume that the gentle elephant ride is harmless. However, in order for elephants to submit and obey, most must survive the Phajaan or Crush, a sickening process of breaking an elephants spirit, by torturing a young elephant until they are on the brink of death. Forced into a tiny pen, young wild elephants torn from their mothers have their limbs awkwardly stretched and tied, restricting their movement as they endure days, sometimes weeks deprived of food and water. They are repeatedly beaten with sharpened bamboo poles, nails, knives or hot metal iron until the elephant is broken. Only then does the elephant’s assigned Mahout swoop in to release the elephant from the crush. The elephant is manipulated into thinking the Mahout is being rescued and willingly accepts training. Elephant camp owners argue that not every domesticated elephant undergoes Phajaan. A small percentage of captive born infant elephants, who’ve been around humans can be trained without the crush. While there is a minor group of elephants born into captivity, most Thai elephants are purchased from professionals who capture wild elephants and break them to be sold. Years ago on a stifling hot and humid day, I had regrettably sat atop an elephant. I ignorantly grinned from ear to ear as I rode her around the hard dusty tracks. I spared no thought that the combined weight of three adults and the hot metal howdah (elephant seat) would damage her delicate spine. No consideration was made for the burden she silently suffered from the constant and excessive elephant rides nor what this 2.5 tonne magnificent animal endured to submit to carrying us on her back. Captive Asian elephants like the one we rode have an average lifespan of 48 years, though they can live for much longer. When we walked away from ours; we were oblivious of her destiny. The remainder of her life would be spent taking tourists down the same well-trodden path, exposed to the sun and heat, often deprived of food and water for long periods of time. If she was lucky she’d avoid serious injuries or infection, which due to high vet costs would be left untreated. For an animal that thrives on a social group, she’d typically lead a lonely life, most tethered to prevent escape. An expendable commodity for our entertainment, she’d work well into her old age, sold from one elephant camp to another, carrying tourists until she physically could bear no more. Elephants forced to give rides are reminded of the painful Phaajan process by the bull hook held casually in their Mahout’s hand. The medieval looking sharp metal object is used to pierce sensitive ears or sink into the skull to ensure the elephant stayed on task. Often the only technique an inexperienced and underpaid Mahout knows to negatively reinforce behavior, to frighten the elephant into submission. 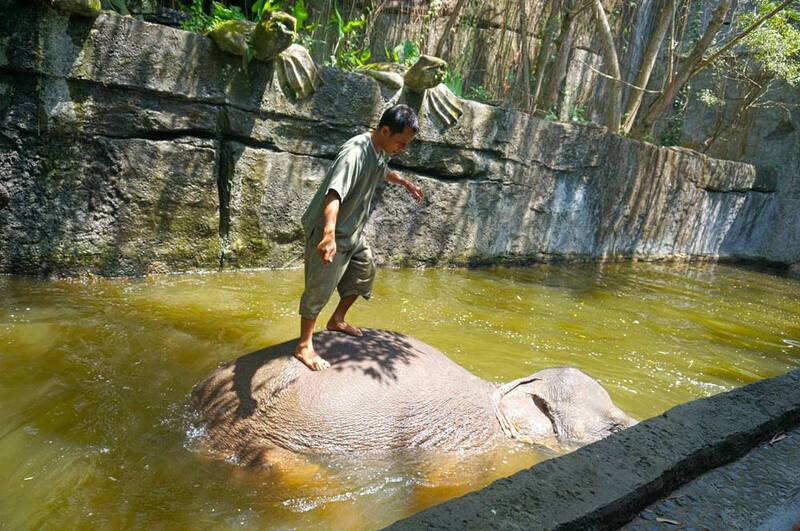 The issue with elephant rides is not as black as white as declaring all Mahout’s evil and heartless. The mighty elephant is part of a 800 year Thai legacy, sacred in the eyes of Buddhists and a powerful icon for Thai Kings who’ve ridden elephants into war and adorned them on national flags as a Royal symbol of wealth and power. It’s this rich history of Thailand’s captive elephants that solidifies the cultural acceptance of working elephants and everything associated with, including the centuries old and horrendous Phajaan process. Previously a Mahout inherited the respected role as the elephant’s primary caretaker through the family. Mahouts would grow up surrounded by elephants and train for years to bond with their chosen elephant. 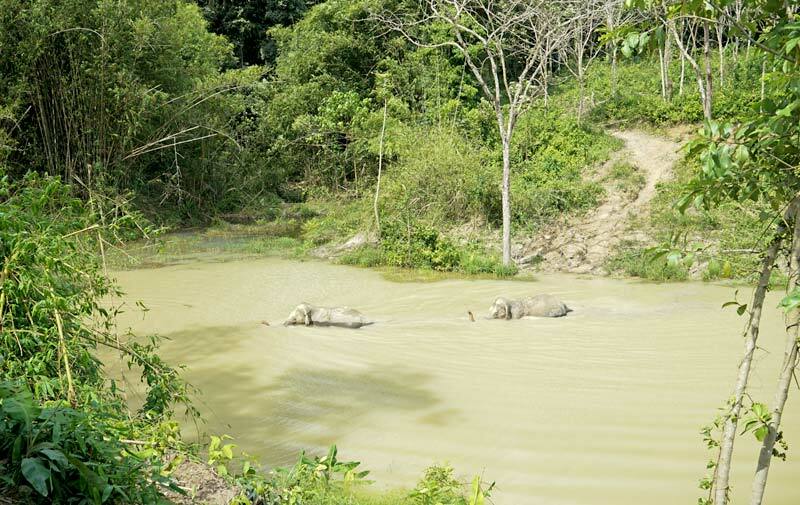 However cruel the process of breaking in an elephant and the backbreaking work endured by an elephant to log forests and haul heavy loads, Mahouts protected their asset and ensured the elephant was not excessively overworked. So in sync were Mahout owners with their elephant they could understand the elephant’s body language, their quirks, habits, likes and dislikes. As unnatural as the bond is, the Mahout and elephant lives become intertwined. There’s a misconception Mahouts show no compassion for their elephant. We often assume Mahout’s are constantly beating their elephants, yet there is an element of care. Any mistreatment is often from neglect rather than abuse, by not being able to afford vet treatments or secure the 150 kg of food elephants can consume per day. The once respected role of a Mahout is now made up predominately of working class males, often immigrants from poor communities who do not own their elephants. Hired Mahouts are a source of cheap labour for elephant camp owners and looked down upon by the upper class. A hard and laborious job exposed to hard conditions with high risk of injury, they hold no vested interest and are willing to take shortcuts. They treat their role as a low salaried day job and can work the elephants unreasonably hard in order to go home after they’ve reached their quota. Rightly or wrongly they use the barbaric bullhook as a means to control a 2500 kg animal from harming tourists. While we Westerners are quick to point fingers and cast judgement, the elephant riding business is complex where workers depend on the money generated from tourists to feed their families. The most constructive way for us to make a change is to break the ugly co-dependent cycle by saying no to elephant rides, elephant safaris and elephant entertainment. We should insist only on ethical elephant tourism or better still – leave the Thai Asian elephants alone. When the demand for elephant rides dissipates, elephants may continue to roam in the wild, creating a domino effect where elephant owners are forced to change to survive and the perpetual cycle of cruelty to captive elephants has a chance to end. The huge amount of Phuket operators who push elephant rides prop up our ravenous demand for a close elephant encounter from treks to neon lit elephant shows. 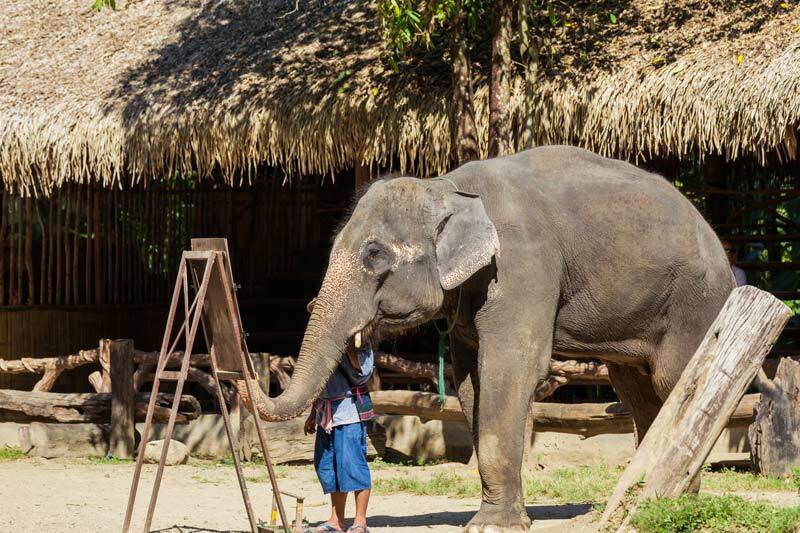 An ugly cycle where legacy tourism operators assume elephant “entertainment” is what we want and we continue turn a blind eye to the misery of Thailand’s Asian elephants. 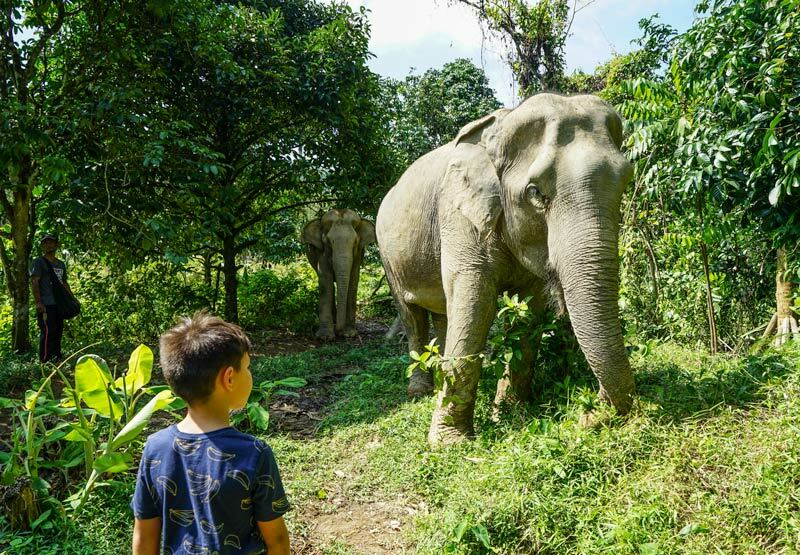 Take a walk with the elephants at Phuket Elephant Sanctuary – no need to ride, pet or swim with them. 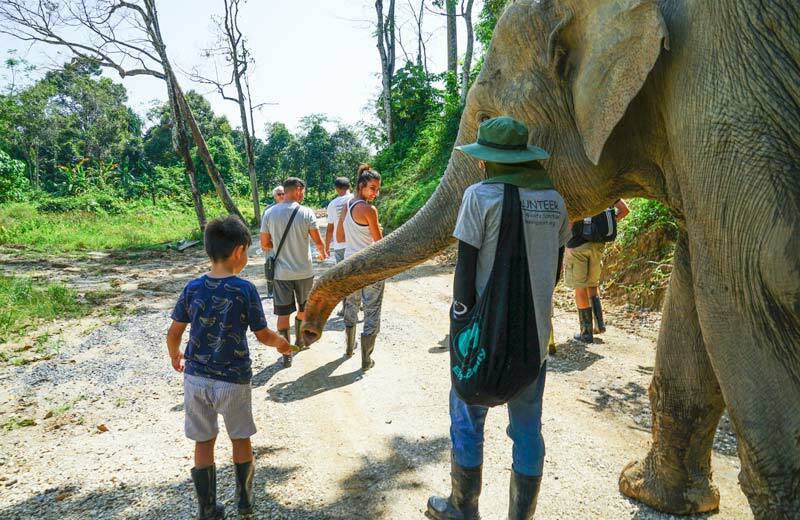 Up until Phuket Elephant Sanctuary opened in November last year, no ethical elephant tours were existed in the tourist mecca of Phuket, which last year drew 31 million visitors to the region. Those that advertised as ethical sanctuaries are simply not. 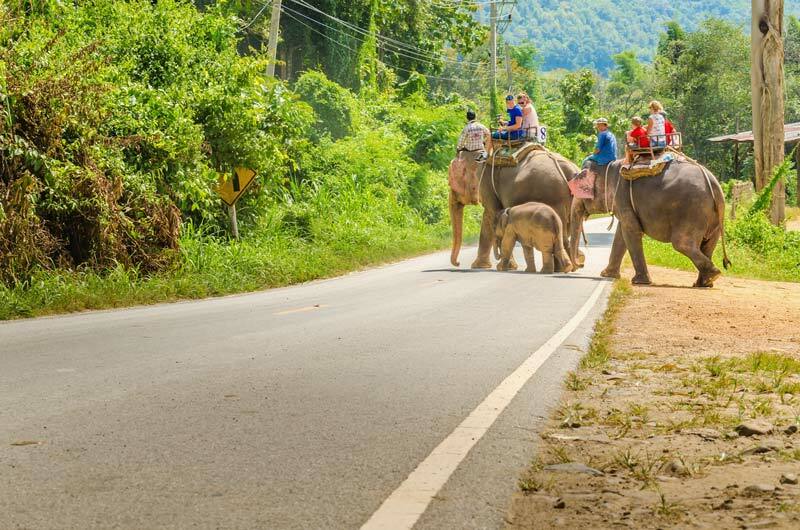 There’s an unusually large selection of Elephant safari camps and ‘shows’ that conveniently line the main road on the mountain along the way to Phuket’s Big Buddah. The steep and dusty properties is no place for elephants. One safari camp had a small pen holding a grown adult elephant tethered to a pole at the entrance. Whilst tourists took their happy snaps, the young elephant was gently swaying, rocking its head and occasionally thumping it’s trunk along the ground. Usually an uneasy feeling in your stomach, observation and an awareness of surroundings can uncover the truth. If intuition is telling you that the elephants look unhappy or the workers at the elephant tour seem careless, they can point to signs that the elephant camp or tour is not up to scratch. Performing tricks at a zoo (rolling an elephant for a bath) had I trusted my instinct I would have realised sooner that this is no way to treat these gentle giants. There are plenty of tourists that visit a elephant camp with an opinion that everything appears above board. There are plenty of tricks and deviations to make it look like the elephants are treated humanely. No longer can we put our hands up and cry “we didn’t know”. 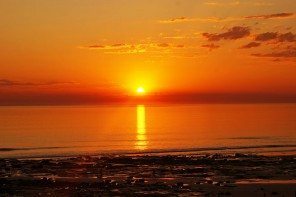 It’s our responsibility to uncover the truth, observe, ask the right question and trust in our gut instinct. Look out for the use of bull hook, used to intimidate and negatively reinforce an elephant’s behavior. It could be a discreet pierce of its sensitive ears in the direction they want the paintbrush to move or a sly dig into the skull to force the elephant to stop, start or go in a particular direction. Mahout’s carry a bull hook by their side as a physical deterrent, some hide a bull hook or tool to inflict pain in their bags “just in case” the elephant does not obey instruction. The bullhook is a sharp metal instrument used to negatively reinforce the elephant. If in doubt, ask elephant tour operator of their thoughts on bull hooks. It’s likely, owners and staff who are quick to defend the bull hook as a deterrent to protect tourists also use a bull hook for safe measure. They may claim it doesn’t hurt, it’s only used lightly or as a precaution. Make no mistake any use of the bull hook, regardless of how often used, is to cause pain for the elephant. At Phuket Elephant Sanctuary, Mahouts carry only bags of fruit to positively reinforce a behavior. We were given fruit to feed the elephants along a walk and from time to time, Mahout’s would whip out a sweet ripe banana to gently coerce them back on the path. When there was something of more interest like bamboo to strip down or leaves to reach, instead of punishing them, they would be welcomed to it and us bystanders would have to wait. The Mahout never controlled the direction and pace of the walk through negative reinforcement. Whilst we were happily given some fruit to feed the elephants, we were also advised to not get too close or touch the elephants without food in hand. 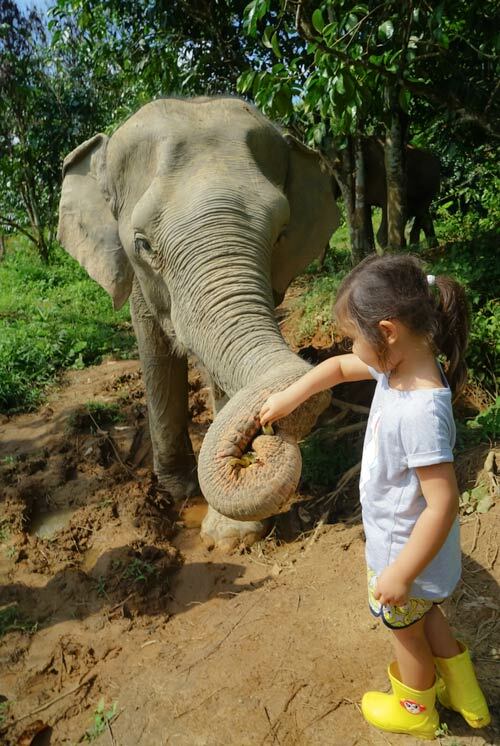 A gentle touch of the trunk after a feed is permitted but guests are reminded to be respectful of the elephant’s personal space, to allow minimal human interaction at Phuket Elephant Sanctuary. 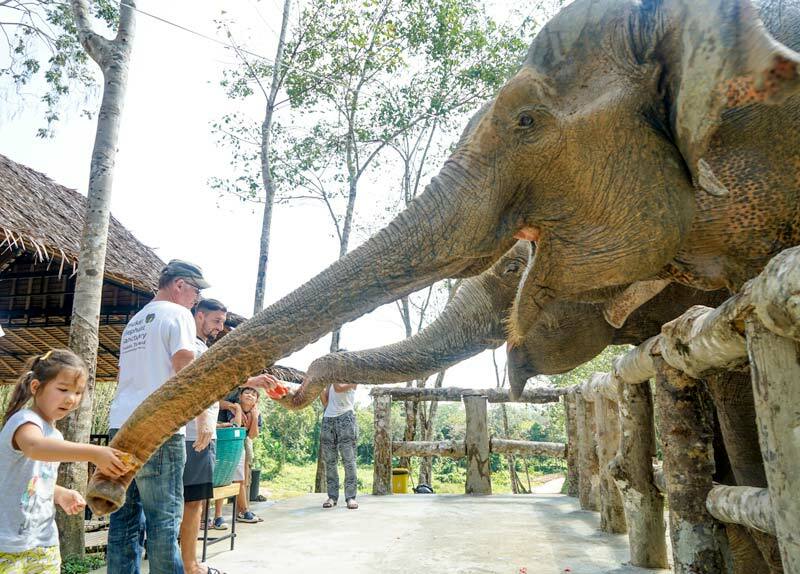 Feeding a rescue elephant at Phuket Elephant Sanctuary. 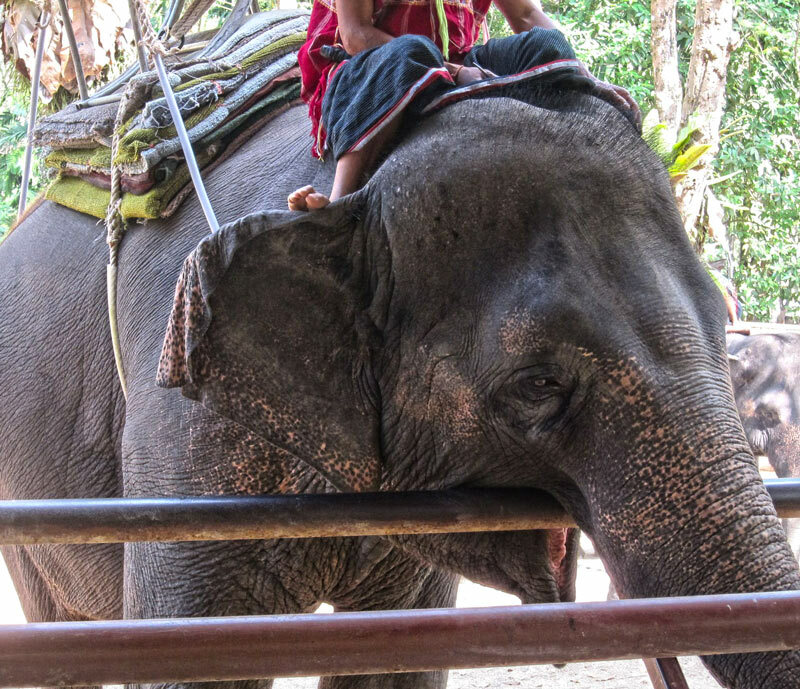 In Phuket an ethical elephant tour will not offer elephant rides. 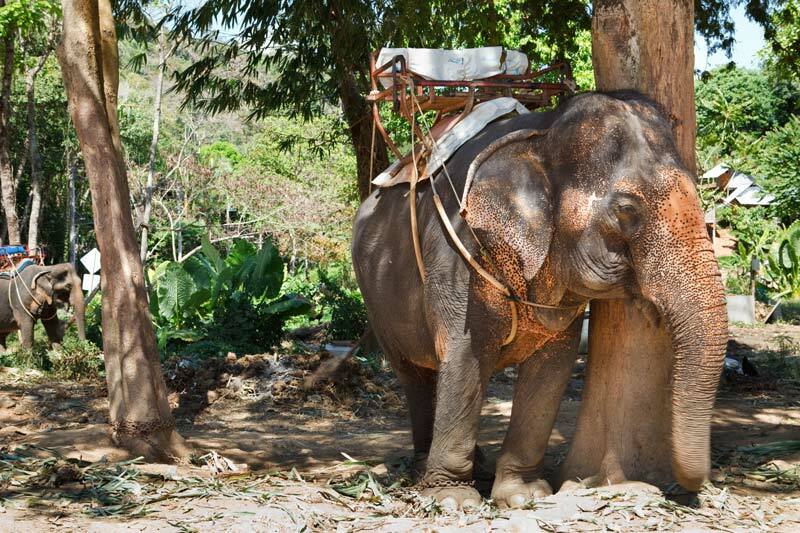 Elephant rides are absolutely unacceptable regardless of whether rides are offered bare back or on the neck. If a tour offers rides, it means that the elephants have been broken and domesticated to allow people to ride them. Ethical elephant sanctuaries do not promote elephant performances, elephant shows or any “add ons” for exclusive elephant encounters like providing tourists elephant kisses with their trunks and other tricks. At Phuket Elephant Sanctuary there are no special requests, tricks or shows – just a walk amongst gentle giants. At an ethical elephant sanctuary there are no need for chains, ropes and ties. They should not be seen wrapped around the legs of elephants or tied around trees. There shouldn’t be holding pens with ropes and ties tethered to a fixed object. All these are indications that elephants are not free to roam and are locked up or restricted for periods of time. 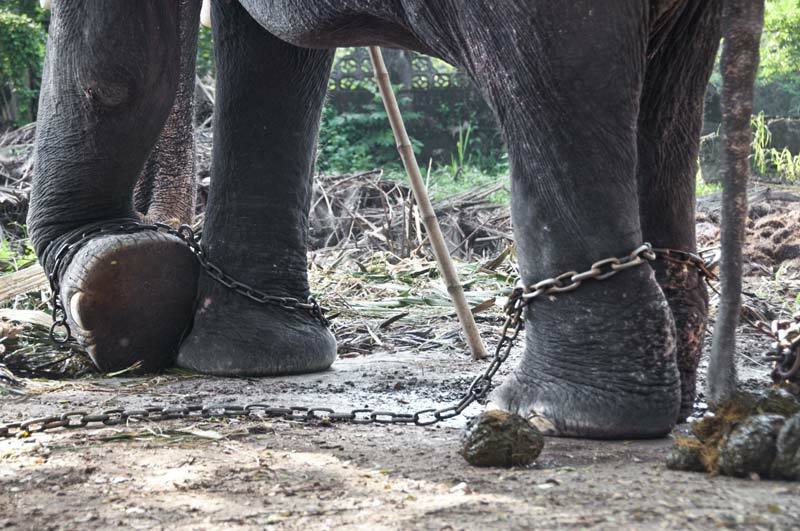 At Phuket Elephant Sanctuary, there were no chains, ropes or ties anywhere around the property or around the elephant legs. Elephants were free to roam as they pleased and had a dedicated purpose built barn and sleeping area at night – free of chains. 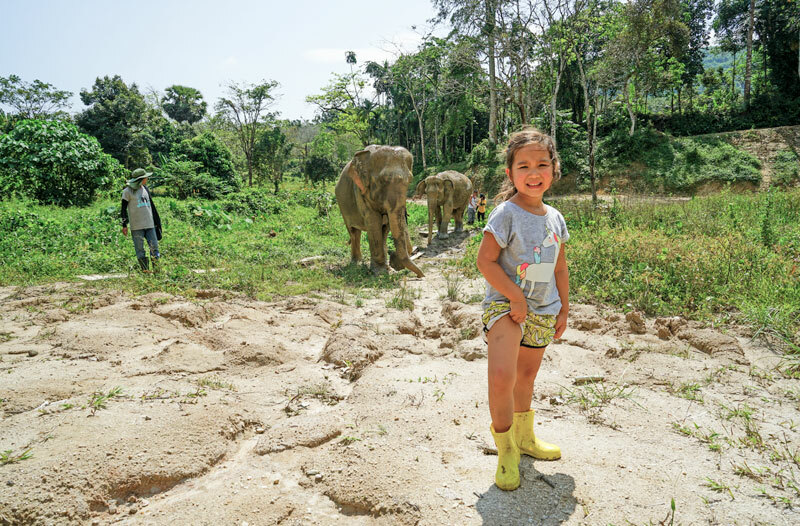 Phuket tours that promote a swim with the elephants and to ‘bring your bikini’ for mud bath followed by a shower from the elephants are most likely not putting the best interest of the elephants before the needs of tourists. Although there’s nothing wrong with wearing a bikini, it’s a good giveaway that the tour operator is not the most ethical if they promote a brochure with happy bikini clad smiling tourists being showered by an elephant in the river. If in doubt, take note of where the Mahout is located when an elephant is showering the tourists, they are usually strategically by the elephants ear, applying pressure to signal an elephant to perform this trick. Where it’s a grey area is when a Mahout isn’t seen to be mistreating the elephant. The most likely reason is that the elephants are so well groomed, the trick so ingrained that it becomes second nature. 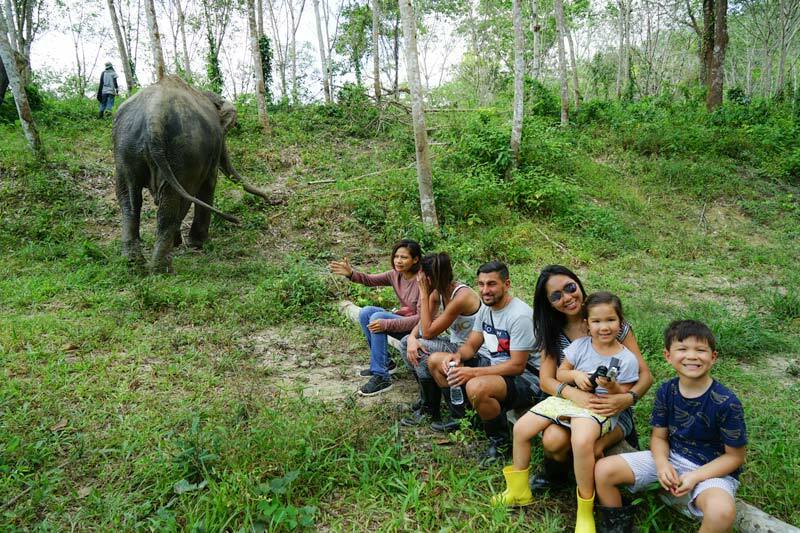 Ethical elephant tour operators in Phuket insist elephants be in their natural surroundings and only promote natural behavior seen from relaxed elephants in the wild. The role of a visitor is as an observer and does not require demands for elephant showers or swims. There are some ethical elephant sanctuaries that allows tourists to stand at a distance and splash water on an elephant when they are having a bath. 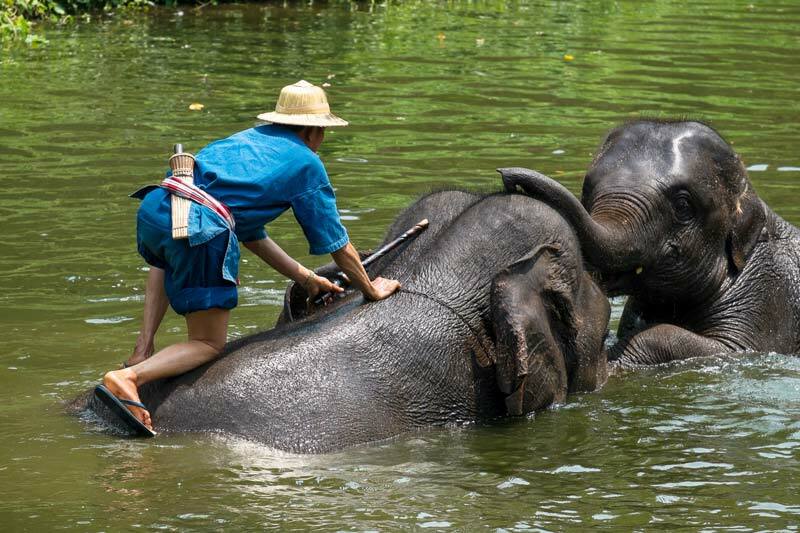 Be wary of elephant tours in Phuket that involve visitors getting into the water with the elephants, allowing tourists to ride on their necks in the water or climb on the elephants trunk in the water. Phuket Elephant Sanctuary take it a step further and do not offer a bath with the elephants, instead we watched them wade into their purpose built dam from the top of a ridge. 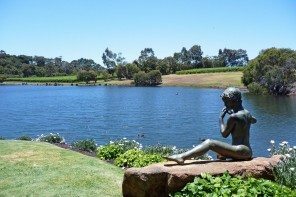 The sanctuary also insist of a dress code where no bikini’s or midriff tops are allowed. A little prudish perhaps, the rules which are somewhat relax and act as a mark of respect tourists should have for the sanctuary and the elephants, much like a visit to the temple. 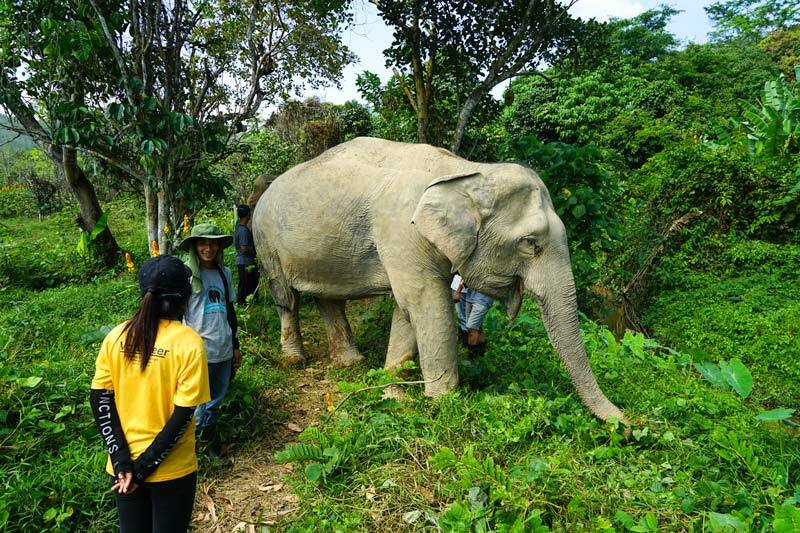 While the highlight of our Phuket Elephant Sanctuary tour was an elephant led walk, the itinerary was rather loose. Our walking companions, rescued elephants Madee and Kannika dictated our journey, they’d make the call as to when we would stop or continue on. 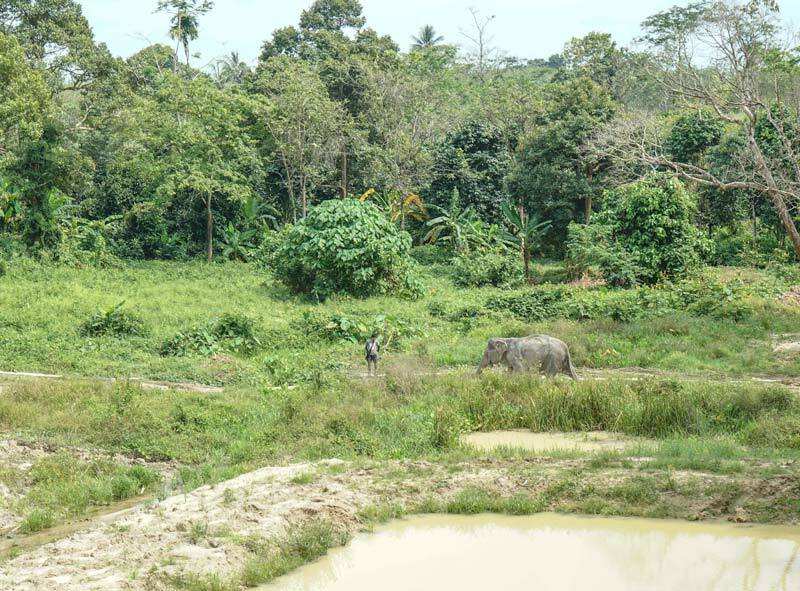 There was no interference from the Mahout as we watched them slap mud on their bodies from a small water hole or stop to push a palm tree down in the spacious property, with potential to house up to 50 elephants. Infant elephants up to the age of two years are completely dependent on their mother, some young suckle past the age of two. An ethical elephant sanctuary does not parade baby elephants around or have them on show. If there are infant elephants they would be cared for by the herd and protected by the mother and not left alone or at the hands of pawing tourists. At ethical sanctuaries, most elephants are rescued from elephant camps are mature females who have become ill or at a ripe retirement age. Most sanctuaries do not have an abundance of infant elephants, unless they have been orphaned or by chance born at the sanctuary when their mother was rescued, these are exceptions to the norm. If an ethical elephant sanctuary has an abundance of infant elephants, it could be a signal that this is a for profit tour operator claiming to be a sanctuary. There is a big difference. An ethical elephant sanctuary will have content elephants and you don’t have to be an animal behaviorist to know when an animal is happy. Just like dogs, elephants wag their tails from side to side when they are content. Their eyes are relaxed and they have a slow swagger about them. Other signals include having a healthy appetite, taking in food and drinking water. 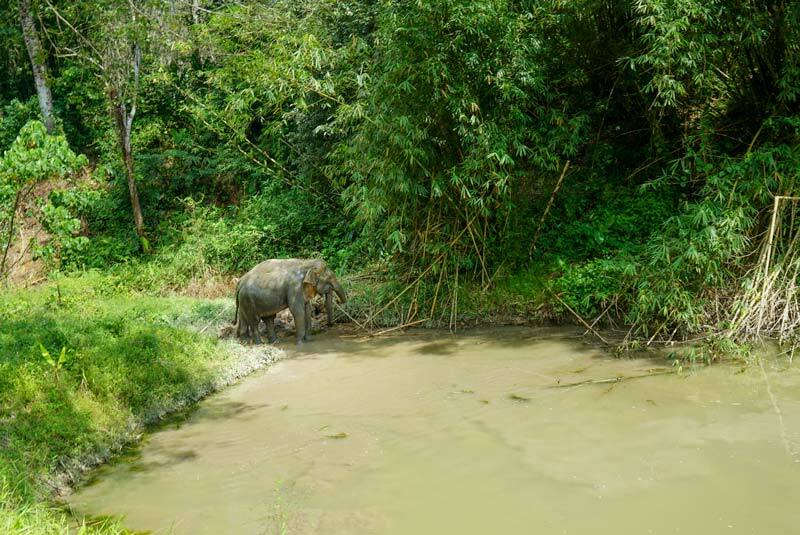 The surroundings are also another identifier of an ethical elephant practice where it’s a clean, well-maintained property with shelter, food and water readily available. There might even be some toys and objects to entertain the elephant. Some signals of distress include bright wide alert eyes, rocking from side to side and trumpeting. Other signs to look for include recent or new scars, open wounds around their ankles, ears and head, which could be signals of mistreatment. 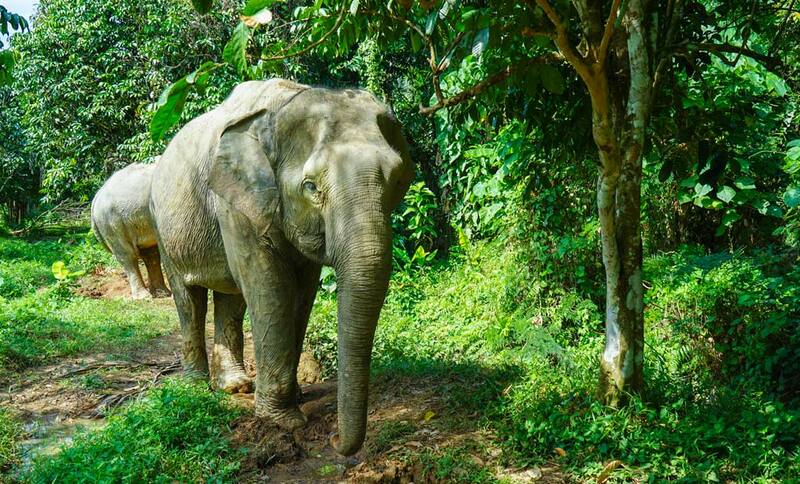 Where do the proceeds of Phuket elephant tour go? Ethical Elephant Sanctuaries are often not-for-profit charities or organisation with proceeds that go straight back into the sanctuary for the care and maintenance of the property, staff and elephants. If a sanctuary is structured as a registered charity these are positive indicators that it is ethical, reliable and trustworthy. Ethical elephant sanctuaries should not shy away from answering questions on where the proceeds go and the proportion that goes directly back to the sanctuary. This differs to a private business where profits go directly to the business owner. Phuket Elephant Sanctuary is structured as a charity although supported by a private business under ‘Chang Chang Chang’ which is a registered Thailand business. This could mean that there is a percentage of profits that go to the business owner who originally funded the sanctuary. Championed by Lek Chaliert, pioneer of ethical eco tourism and founder of Chiang Mai’s Phuket Elephant Sanctuary and also the founder of Save Elephant Foundation a charity in pursuit of the protection of Asian Elephants, these are all positive indicators that Phuket Elephant Sanctuary offers ethical eco tours in Phuket. 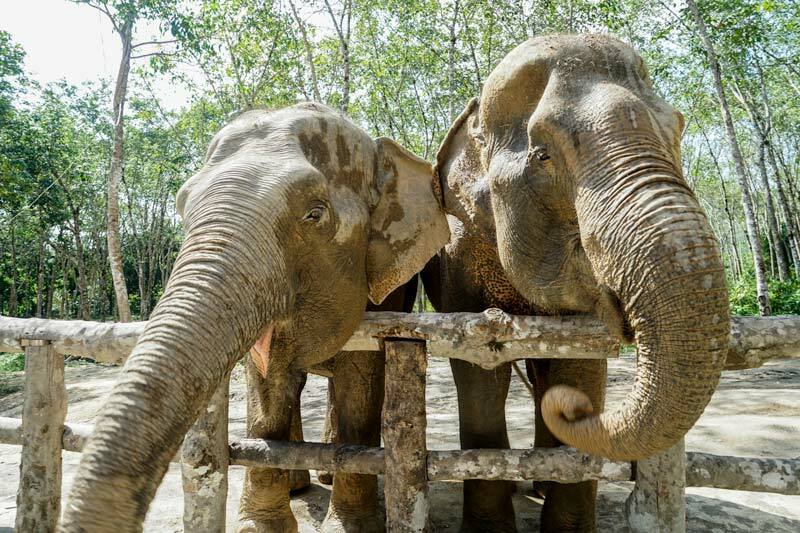 Only a tiny few of the 4000 captive elephants in Thailand receive sanctuary. Most are elderly elephants who can no longer work at elephant camps or fall ill and offered for purchase to Phuket Elephant Sanctuary. These are among the lucky ones who are given an opportunity to spend their days cared for and in comfort, free from the work and the hardships they had suffered throughout their long lives. 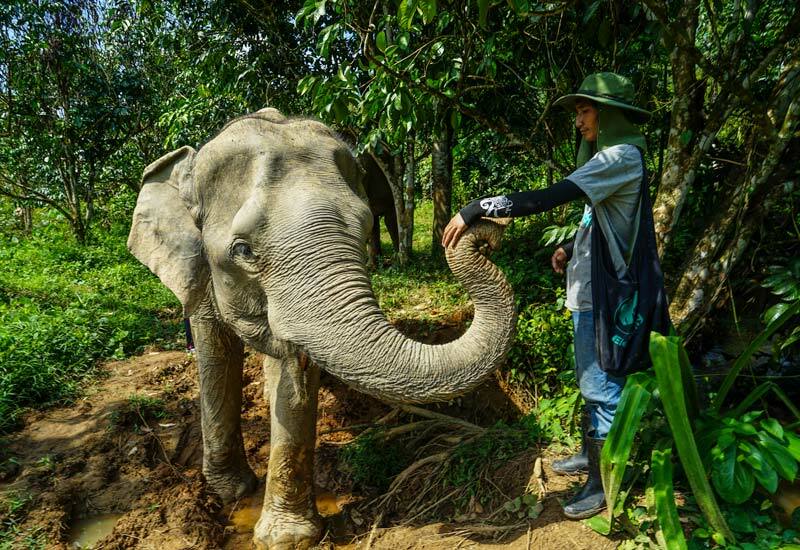 While providing shelter for the frail elephants is Phuket Elephant Sanctuary primary goal, they also offer training to elephant camps on the responsible treatment of elephants and offering to guide an approach using positive reinforcement. 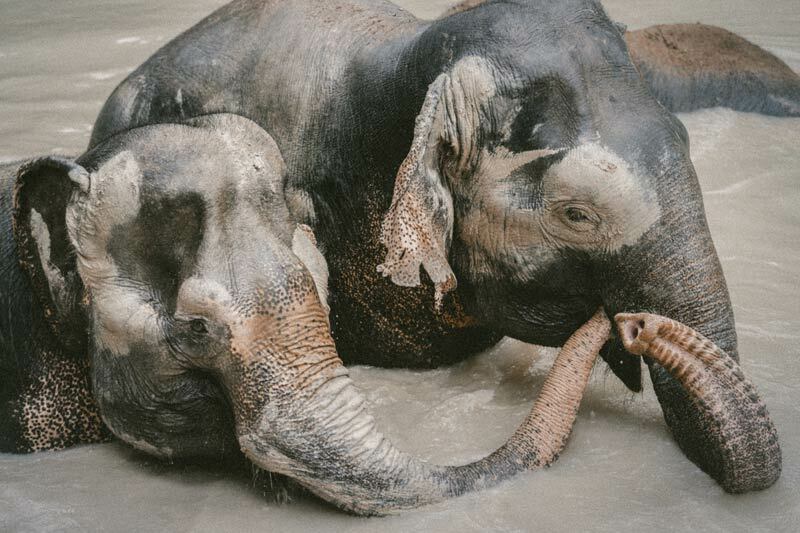 An ethical elephant sanctuary offers to rescue, rehome and rehabilitate captive elephants. 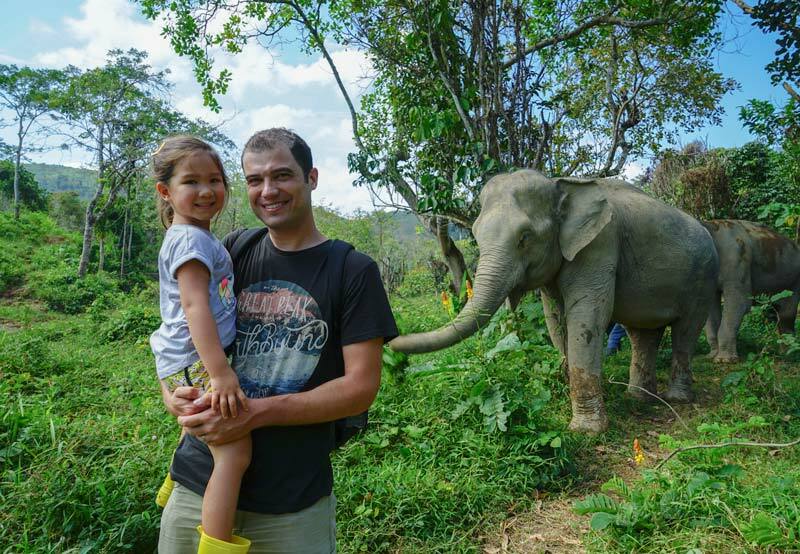 In Phuket it’s important to ask the elephant tour where their elephants come from as well as questions around how they help captive elephants. Ethical elephant sanctuaries do not breed more elephants into captivity or purchase elephants as stock, especially relatively young and healthy ones. These are signals that the tour operator focuses on profit rather than protection. Just because there is the word ‘sanctuary’ in the name of elephant tour operator, does not make it so. Make no mistake that Phuket Elephant Sanctuary is the only ethical elephant eco tourism operator in Phuket. Elephant Jungle Sanctuary is making some of the right steps in elephant conservation, the term sanctuary is used loosely. Some commendable steps is to exclude ride on the elephants backs during tour and allowing them to be free from chains for the most part. Be aware that the Elephant Jungle Sanctuary is a business, a Thai company registered to make profits, with proceeds that go to the elephant camp owners who hire out their elephants to the sanctuary for a return. Elephant Jungle Sanctuary do not own these elephants and therefore have not been retired or rehomed to live out their days in the sanctuary. 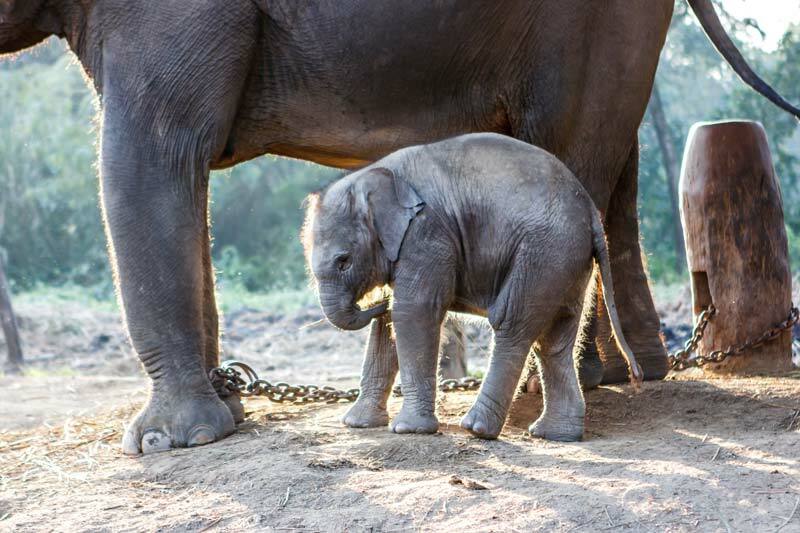 It’s admirable that owners are participating in a harness free alternative to elephant rides, a positive step in the right direction, though not exactly in the best interest of the elephant. There is also no charity associated with Elephant Jungle Sanctuary and it is not internationally recognized as a non-profit organisation for elephant conservation. Elephant Jungle Sanctaury is not recognized as an animal rights or foundations purely in the interests of conserving Asian elephants in Thailand. What are their opinions on bull hooks and negative reinforcement? How do they get the elephants to behave? Do Mahouts carry bull hooks? Do they allow elephants to perform tricks? 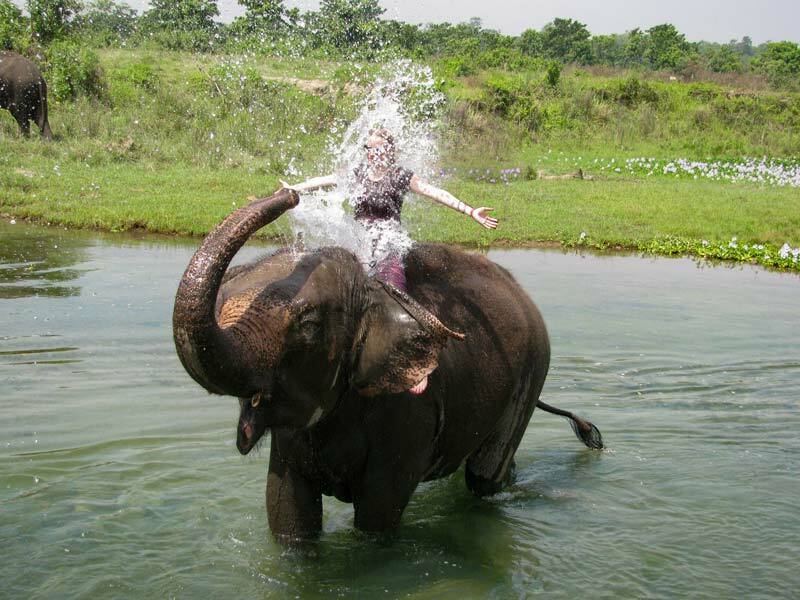 Can tourists shower and bathe with the elephants? What are their opinions on the use of bull hooks? Can visitors pet or cuddle the elephants? Are there allot of infant and young elephants? Are the elephants held in pens, tethered and allowed to be petted in a pen? What percentage of the proceeds goes directly back to the sanctuary? At Phuket Elephant Sanctuary all these questions can be answered with a focus on the well-being and protection of the Asian elephants. 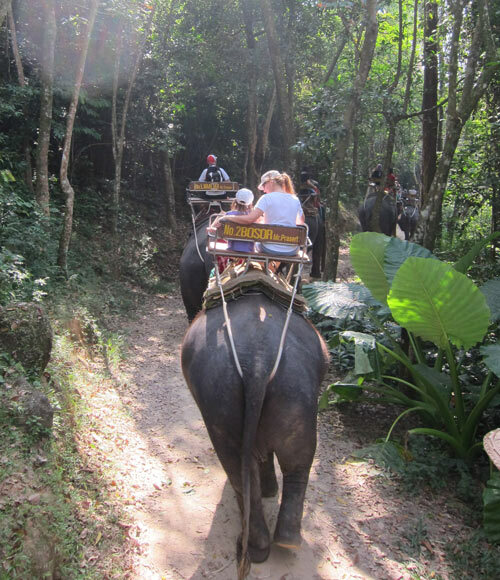 Phuket Elephant Sanctuary operates morning and afternoon tours daily. The cost for an adult is 3000 Baht (aprox $115 AUD) and half price for children aged 12 years and under at 1500 Baht (aprox $57.50). Kids 2 years and under are free. A vegetarian buffet, elephant feeding and walk is included in the morning tour. The vegetarian buffet is part of the Phuket Elephant Sanctuary morning tour. The afternoon elephant tour is recommended for adults and teen (kids 12 years and up) as it involves walking around the resort to locate the elephants in the sanctuary and plenty of sitting and observing the elephants in their natural habitat. 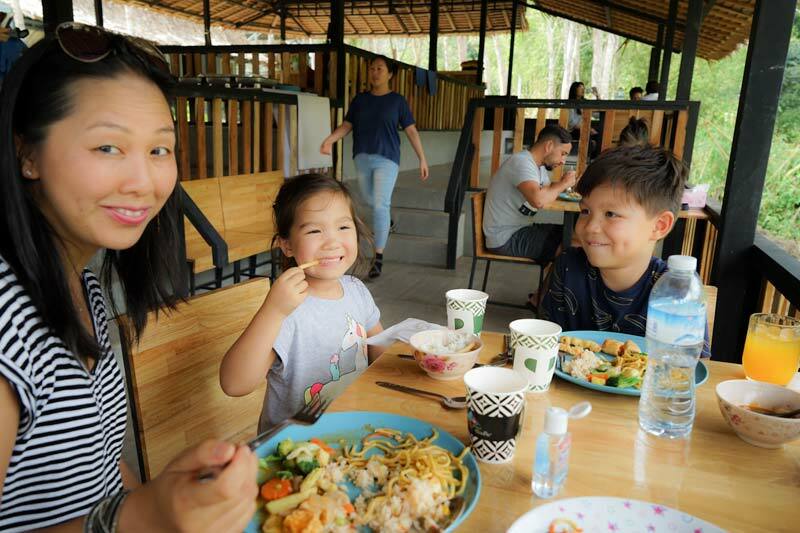 A vegetarian buffet and non-alcoholic beverages are provided on the afternoon tour and elephant feeding is also included. The key difference between the morning and afternoon tour is the patience required to observe the elephants. I feel my kids would tire after the first 30 minutes. The other major point of difference is that visitors walk the elephants back to their shelter. 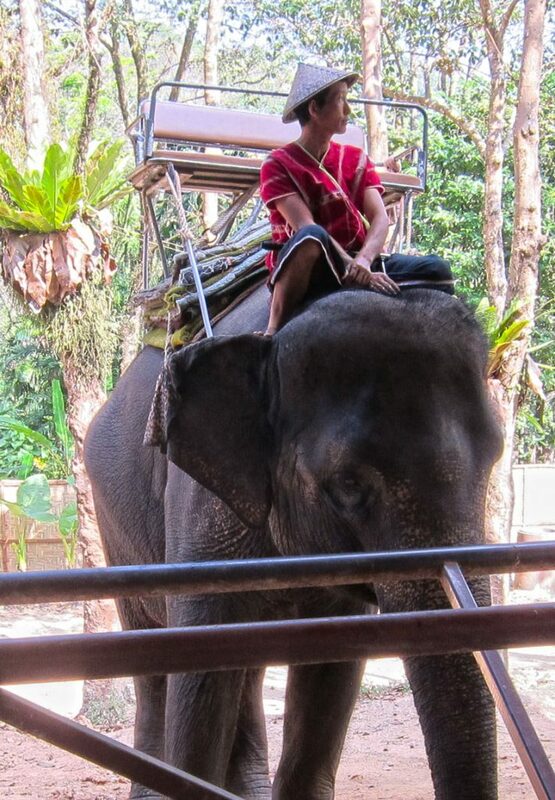 It was surprising for me that kids are not usually not the ones that must ride an elephant. Their minds don’t see an elephant as something to be ridden. Kids minds are quite logical and know that a huge majestic grey animals should be kept at an arms distance. Heart warming as they are the generation that can break the cycle and welcome a new way. That’s only if we haven’t corrupted their minds along the way. I was surprised to find that in most instances the idea to ride elephants is seeded by adults rather than advocated by children. 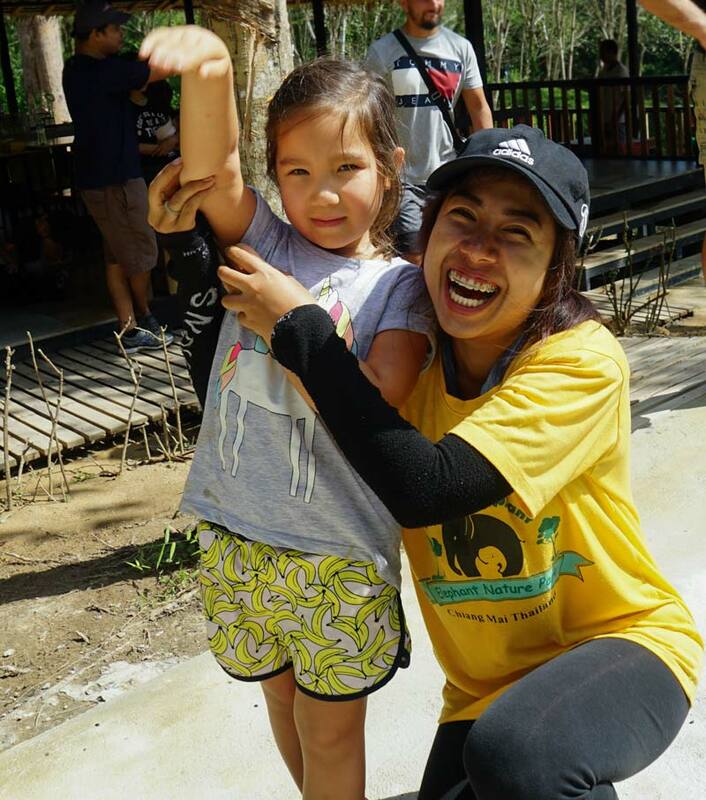 When founders of Phuket Elephant Sanctury, Louise sat our group down for a presentation about who they are and the plight of the Asian elephants, our kids absorbed the information like sponges. 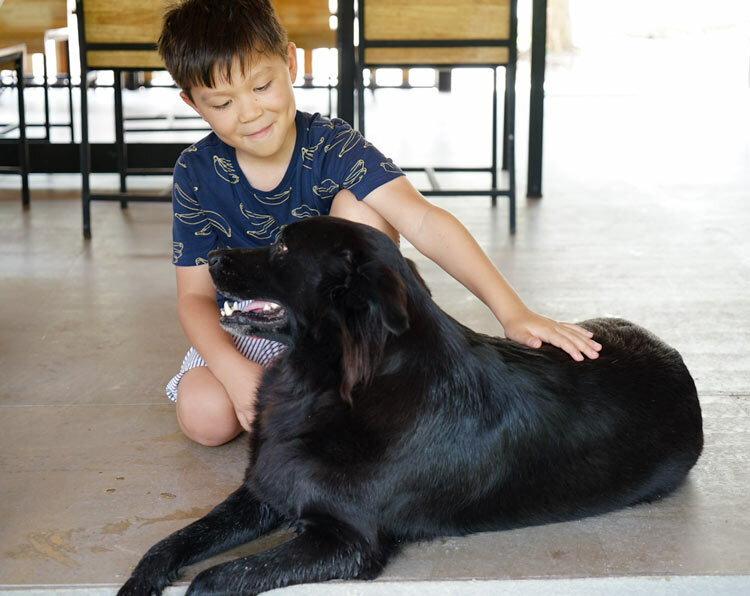 However there are a few things to consider when taking kids to the sanctuary. Be mindful that the content presented may be a bit confronting, there’s a brief video of an infant elephant being tortured in the Phaajan. There’s also a informational video on rules and guidelines when interacting with elephants, presented in animated cartoon. My eldest son, aged 7 was a little anxious not by the Phajaan clip but by the light-hearted video afterwards, a cartoon depiction of elephants accidentally sitting on or kicking visitors who came too close to the elephant. It reminded me that children see these beautiful creatures for what they are, large animals that in the wild can cause people harm, something to be rightfully fearful of and respected rather than a creature that you can climb on top and ride. Bear in mind that the walking component of the elephant tour can be quite long and take up a considerable chunk of the tour. There is loads of stopping to wait for the elephants, often in the heat and humidity as well as through muddy trails requiring gumboots which are supplied. Our kids aged 4 and 7 at the time managed rather well, not completely painless, but the whining was a minimum. Our kids were over their initial excitement of walking and feeding elephants around the 45 minute mark and a little weary as the walk around the property is around 2 hours in duration. To date there are five elephants at Phuket Elephant Sanctuary, however not all five elephants join the group for the walk. Visitors are most likely to have the three firm friends Kannika, Madee and Dok Gaew along with the walk. A new elephant Jan Jao may join the fold. However visitors shouldn’t expect to walk with all five of the elephants at the same time. 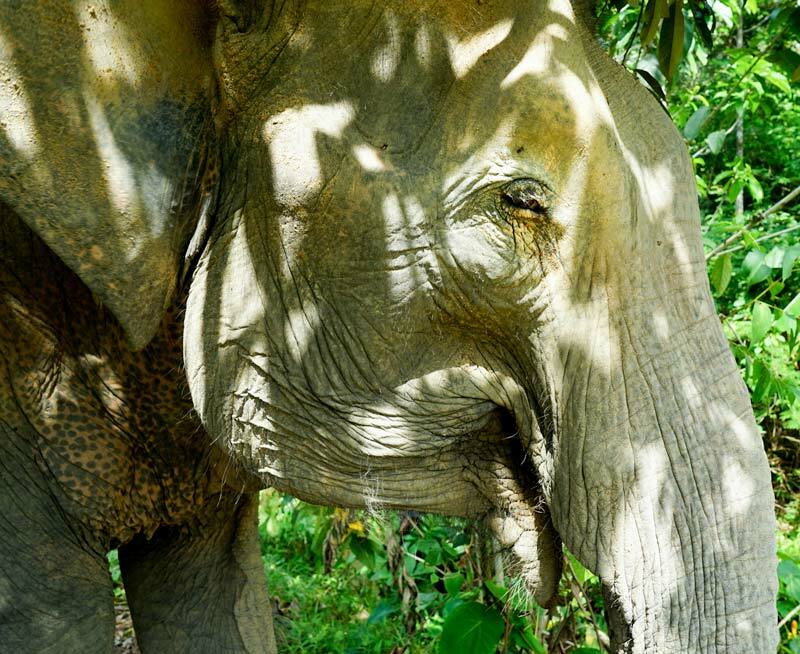 Our favourite elephant was Gaew Ta also known as Darling, blind in both eyes, she was often walking around the property with her Mahout guiding her path away from our group. When we spoke to Louise, her eyes lit up as she explained the plans for Phuket Elephant Sanctuary. Although small in numbers, the huge property can accommodate up to 50 elephants and the long-term plan is to grow it slowly, for the meantime there aren’t herds of elephants to observe and the five magnificent creatures more than enough. Unlike other elephant shows and tours in Phuket, guests are required to meet at the sanctuary office near Paklok. Owners will greet guests who jump into their 4WD for a short 5-minute drive to the property. Organising transfers to and from Phuket Elephant Sanctuary is quite easy, with most drivers and taxi drivers knowing the area. You have to organise own transfer to the pick-up point at Phuket Elephant Sanctuary. 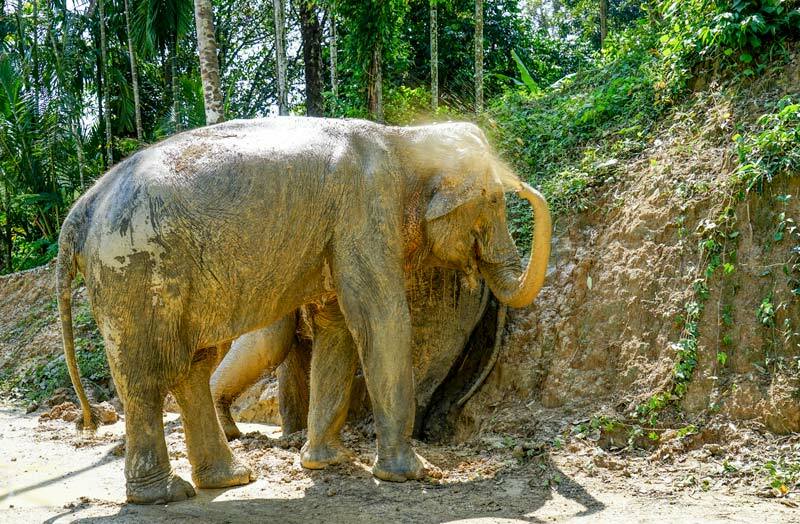 Driven by commissions, some drivers and taxi’s will recommend Phuket Jungle Sanctuary and some will go as far as ‘accidentally’ driving visitors to the wrong Phuket elephant tour. Insist on Phuket Elephant Sanctuary and have the address and phone number of the sanctuary to hand to make a call if needs be. Allow for an early arrival just in case this happens. The need to organise transfers is an extra amount to pay for the experience which is rather pricey if taking a group or family. From Karon to Paklok takes around and hour and a taxi fare ranges from 800-1000 baht one way. 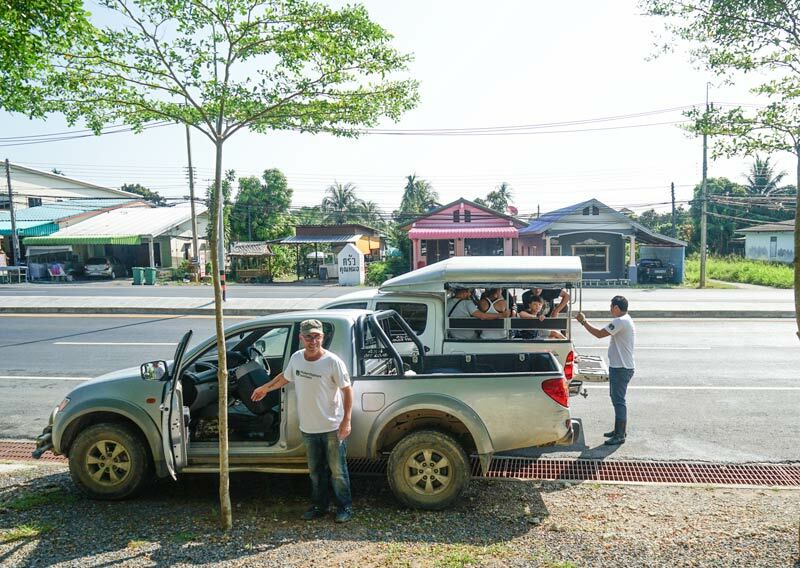 We hired a driver for the day for approximately 1800 baht, approximately 8 hours. We dropped into the markets and old Phuket Town along the way home. 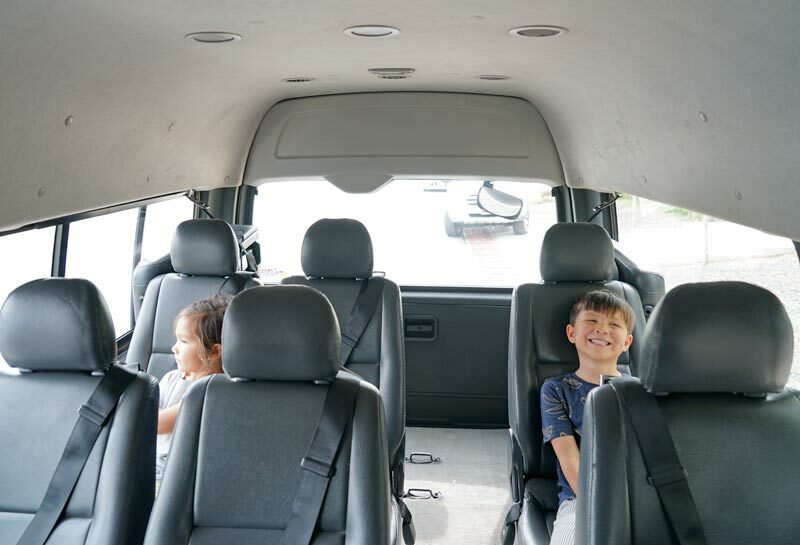 Spacious minivan for just the four of us. 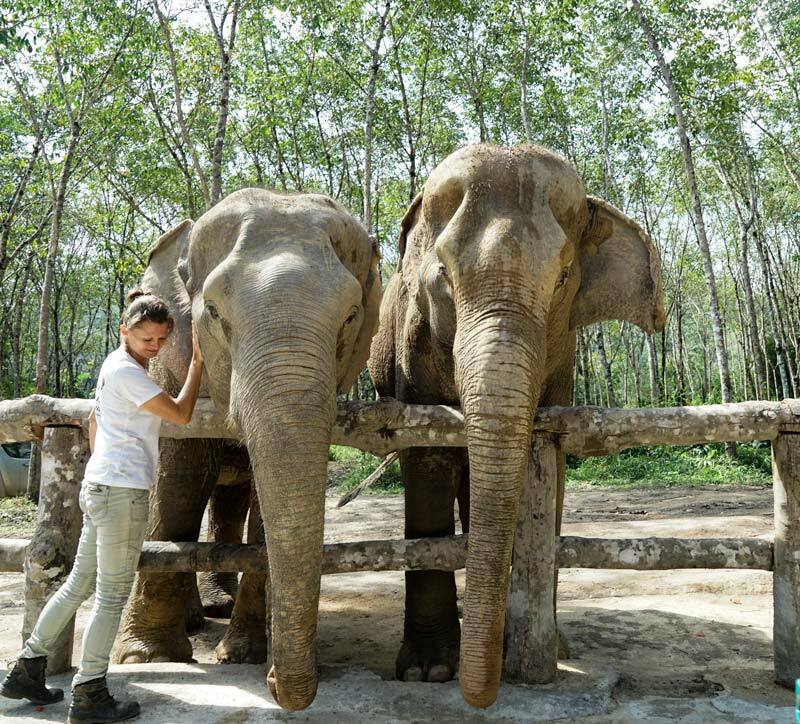 Phuket Elephant Sanctuary philosophy of putting the health and well-being of elephants participated in tours before tourists means that we had the smallest impact when around the rescued elephants, who have been through allot of pain and suffering in their lifetime. Guests to Phuket Elephant Sanctuary are observers, watching and admiring these gentle giants from a safe distance. There is some physical interaction with the elephants, guests are permitted to have a gentle pat of the trunk immediately after offering food. There’s also plenty of opportunity to feed the elephants when taking a soft stroll. We leave Phuket Elephant Sanctuary with a heavy heart, the sanctuary is doing incredible work to rescue elephants from a life of hardship, yet it feels like it’s not enough. In Patong the heart of the Phuket tourist area, there’s glossy brochures, signs and billboards marketing a huge variety of elephant camps and tour. We pass by a busload of tourists heading to Fantasea – a glitzy purpose built arenas with a huge dazzling show of performing elephants. While a handful of elephants have a well-deserved retirement at Phuket Elephant Sanctuary, the numbers don’t stack up and there’s thousands more that are suffering. Millions of oblivious tourists are offered with unethical elephant tours in Phuket. Insist only on tours in Phuket Elephant Sanctuary. Shout it from the rooftops that it’s never OK to ride an elephant. Dig deep and donate to foundations like Save Elephant Foundation and EARS for elephant so that the can continue to rescue elephants and serve their best interests. 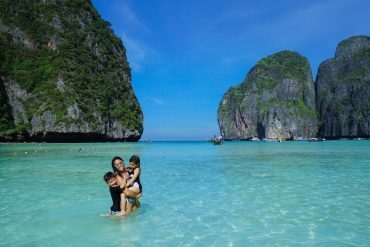 Hit the beach and leave elephants alone, check out our Complete Guide to Phuket with Kids. Ready to book a trip to Phuket? 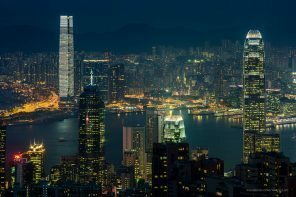 Find cheap flights from any Australian capital city to Phuket with Skyscanner. Previous articleHard or Soft Luggage – which suitcase is best for travel?